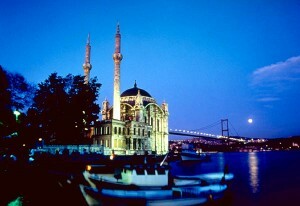 Istanbul is the place where east meets west. This unique city stands on two continents over the River Bosporus, where the Black Seas meets with the Sea of Marmara and the Golden Horn; and it is a magical place to visit! Now a cosmopolitan city with deluxe shopping centres, high class restaurants, nightclubs and bars, intertwined with domes and minarets of the mosques, Istanbul is a “must see” holiday destination. Right in the heart of this bustling city are the historic sights that every traveller to Turkey wants to explore … the Covered Bazaar, Blue Mosque, Topkapi Palace and Dolmabaçhe Palace, there are almost too many to mention. Whether you want to come to this vibrant city for a long weekend or you want a two centre holiday – firstly with the bustling capital and then the relaxed and pretty beach resort of Kalkan, we can arrange your holiday for you including sight seeing tours of some of the most famous sights in Istanbul.